If you analyze it, I believe the very heart and soul of conservatism is libertarianism. I think conservatism is really a misnomer just as liberalism is a misnomer for the liberals – if we were back in the days of the Revolution, so-called conservatives today would be the Liberals and the liberals would be the Tories. The basis of conservatism is a desire for less government interference or less centralized authority or more individual freedom and this is a pretty general description also of what libertarianism is. Not a lot of guys from the Reagan Revolution still doing things in public these days… And those who are, sadly, happen to be strumming a lot of Deep State notes from inside the current administration. Indeed, the Donald’s capture is another aspect I explore in my new book, Peak Trump: The Undrainable Swamp and the Fantasy of MAGA. Larry Kudlow, of course, is blowing up Bubblevision again as the Donald’s chief economic cheerleader. I hired Larry in 1981 when I was Director of the Office of Management and Budget. He was associate director for economics and planning until 1985. He worked on Wall Street, then he got famous on CNBC and MSNBC. Larry’s got a history degree from the University of Rochester, where he also did time with Students for a Democratic Society. I can’t really blame him for that, though, as I also marched to end the Vietnam War. Attorney General William Barr served on the domestic policy staff at the White House from May 1982 to September 1983. Barr did a previous turn as Attorney General for George H. W. Bush from late November 1991 through January 1993. Barr got his start at CIA, then he clerked for a D.C. Circuit judge for a few years. He made some money in private practice and he finally found his way to the Reagan White House. Hard to say whom or what he’s protecting now with is dueling “Barr Letters” about Prosecutor Mueller’s report. 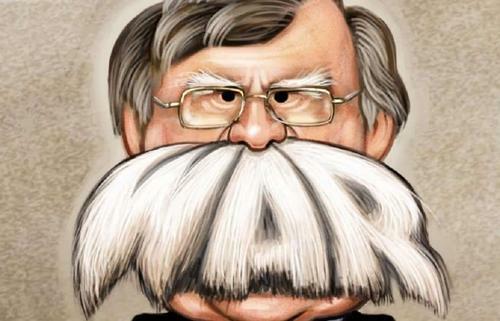 National Security Advisor John Bolton was further out in orbit, an assistant attorney general in the Office of Legislative Affairs at the Department of Justice from 1985 to 1988. He also worked at the U.S. Agency for International Development from 1981 to 1983. And he did some work for the Republican National Committee leading up to the ’84 GOP convention. He’s really famous, though, for his neocon turn in the George W. Bush administration. Meanwhile, where have all the conservatives gone? Whatever threat to it the “Great Disruptor” might still represent, Warfare State groupthink continues to dominate Imperial Washington. Well, No. 1, it depends on how you define “conservative.” One kind has its movement all over the imperial city, professional Republicans in a self-serving but like-minded grift with Democrat regulars in behalf of perpetual growth of “national security” contracts. This one also understands an opportunity to weaponize broad hostility against an easy target. Putin is right out of central casting, of course, a James Bond/Jason Bourne villain waiting to happen. He’s another instrument of “threat inflation”… the “next Hitler” to be contained at all costs. We’ve been playing this game since 1945. Inflating dangers represented by foreign agents is how they justify a Pentagon budget for fiscal 2020 that’ll approach $750 billion, with other commitments that’ll take the total cost for “defense” past $1 trillion. Wait ’til the Duopoly really cranks up operations in Venezuela. Bolton has already done his part to keep North Korea at the slow-boil. And then there’s the National Security Advisor’s “main enemy,” Iran. The Tweeter-in-Chief is famously impulsive. Democrats’ “Russiagate” fury on top of a slowing economy could make him even more prone to high-profile, high-impact distraction. So, where have all the conservatives gone? Desperate times call for… “common sense” measures. And these are desperate times… Markets are corrupted by monetary central planning. They’re confused. And the road back is going to be treacherous.